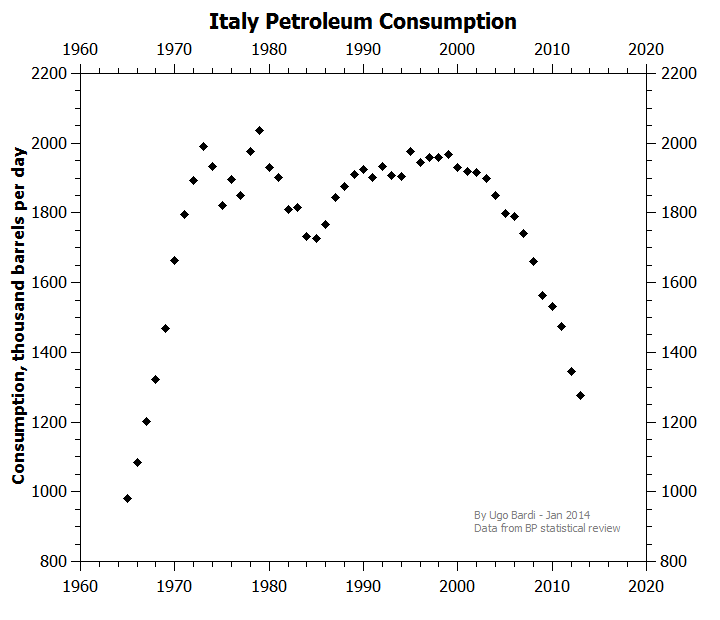 Italy' peak oil has arrived: we are back to 1967 in terms of oil consumption. All the data in this post are from BP statistical review up to 2012, updated to 2013 from various sources. Sometimes, peak oil looks like an intellectual game that people keep playing by arguing whether it has arrived or not. But the point with oil is not how much of it is produced, somewhere, but how much you can afford to use. 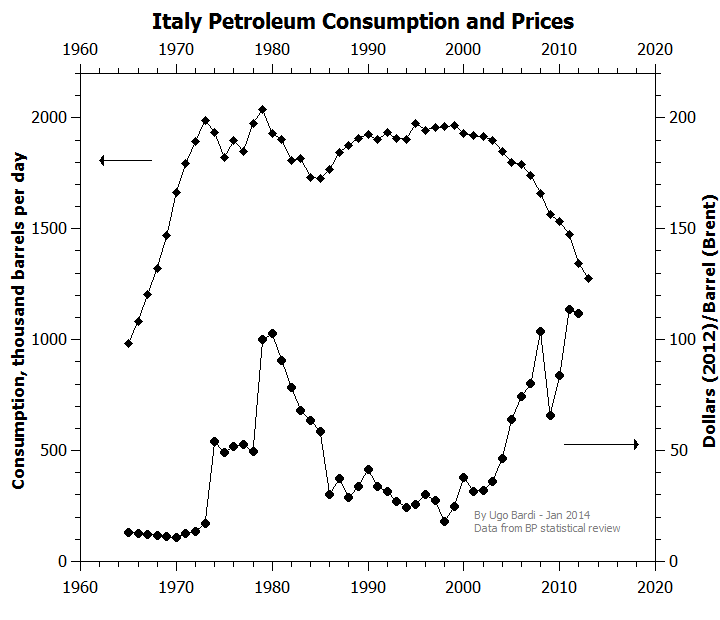 And, for Italy, the peak of consumption has already arrived, as you can see in the figure above. It is impressive: consumption went down of more than 30% in less than 10 years. Today we are back to the levels of 1967. And, in 1967, Italy's population was around 50 million people, some ten million less than today. We really have reached the other side of the peak and we don't see the bottom of the descent. 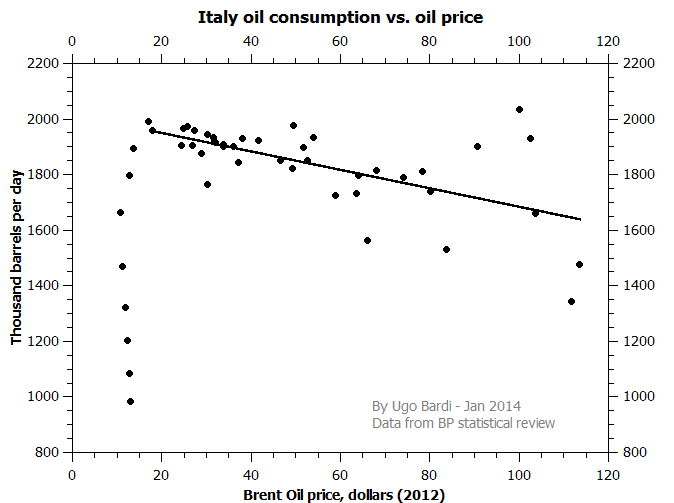 In short, the Italian economy can afford to grow its oil consumption when oil costs less than about 20 dollars per barrel (in today's dollars), it remains stable as long as oil is at less than ca. 40 dollars per barrel and it collapses when oil prices go above that level. 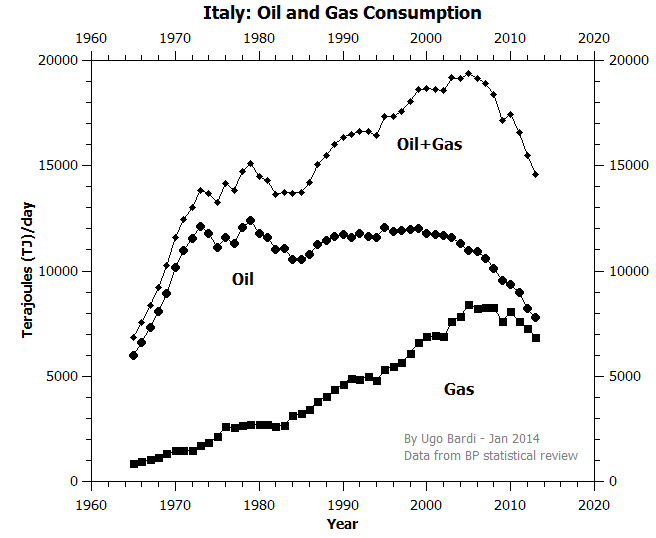 I am sure that now you are wondering about how's life in Italy with one third of oil consumption gone. You would expect empty roads, deserted towns, and a general post-holocaust atmosphere. Well, no; that's not the case. I can tell you that it is hard to see big changes in everyday life in Italy. In particular, at rush hour in town, the streets look jammed with cars as ever. From what I hear from friends and acquaintances, the situation is the same for all large towns in Italy. But arriving to the conclusion that there are no problems in Italy would mean to make the same mistake that our former prime minister made a few years ago, when he said that Italy had no economic problems because "restaurants are full". Restaurants are not the economy and city streets at rush hour are not the country's transportation system. And there is no doubt that transportation is in trouble if we measure it in terms of km traveled. 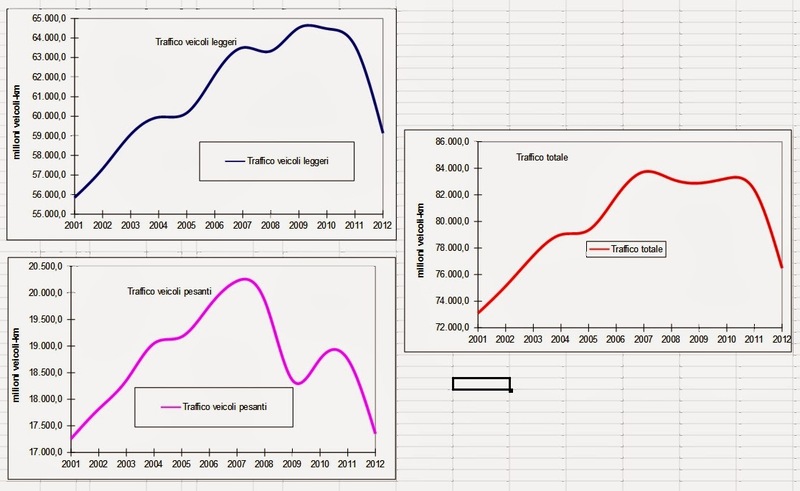 Here are the data (courtesy of Massimo de Carlo at "Mondo Elettrico"). The blue curve is for light vehicles, mainly cars, violet is for trucks, and red is all vehicles. Data from AISCAT, updated to 2012. We see that the transportation system managed to cope - more or less - with the reduced oil supply until about 2008-2010. The peak in km traveled came later than the peak in oil consumption and the decline has been less pronounced: less than 10% for cars and about 15% for trucks. So, it makes sense that the loss of traffic is not clearly noticeable in towns, especially during rush hours. People have probably cut the non strictly necessary travels and it seems that they are still able to use their cars for everyday transportation. They could do that in large part by switching their cars to natural gas and liquefied petroleum gas as fuels. In part also by switching to more efficient cars, although small and hybrid cars in Italy seem to be vastly outnumbered by SUVs. 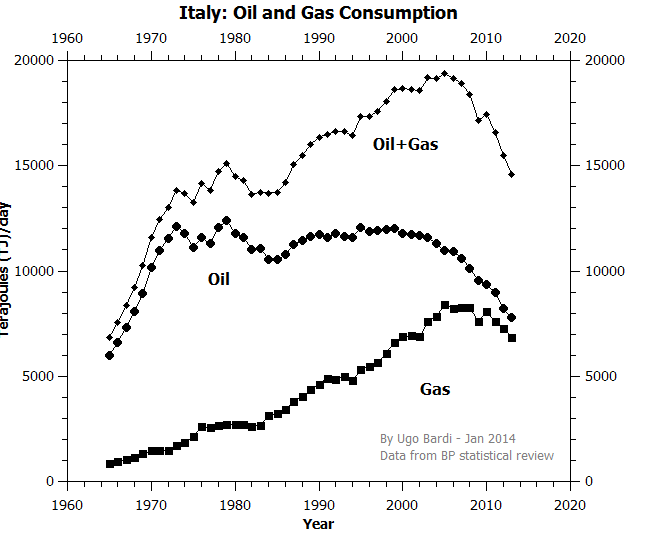 Around 2006, gas consumption peaked and generated "peak hydrocarbons" in Italy. Afterward, consumption has been rapidly declining; much faster than growth. It is a behavior that I termed the "Seneca Collapse". Italy may have the dubious honor of being the first major Western economy to experience this kind of collapse in modern times. So, what's going to happen, now, on this side of the peak? Difficult to say, but if the Seneca collapse continues, in the coming years it is unlikely that we'll be still seeing traffic jams at rush hour (and restaurants full of people). Impressive, and meanwhile you don't have any major economist able to talk about the crisis being an oil shock (if they don't want to talk about peak oil), one of the most amazing thing for me. Maybe another aspect of collapse ..
Petrol/Gsoline comsuption at its PEAK was very elastic. Much of the Happy Motoring people engaged in was Recreational in nature. Even if not strictly recreational, it was consumption that could be eliminated without a major lifestyle change. For instance, instead of driving to buy groceries twice a week, you only do it once a week and buy more. Or even once a month. Instead of driving yourself 100 miles for a family get together, you pick up other family members and drive together in one car. Instead of driving to work yourself, you carpool with a co-worker. So much of the slack here can be taken up without the overall lifestyle changing, but it impacts on revenue totals and tax revenues for sure. The less gas consumed, the less there is in tax revenue to maintain the roads, as this generally comes from the usage fees at the pump. The Morning Traffic Jams don't change that much during this period, but overall the system is winding downward. The issues come when a Critical Mass is achieved and the economies of scale no longer work. Enough Happy Motorists don't fill up at a local Convenience store to pay the Minimum Wage worker at the store at the register. Convenience Store shuts down, now you need to drive twice as far for a fillup. This sort of decay may persist a while, but eventually there is no profit in the refining and distribution, and the WHOLE system collapses. Only time will tell how long this takes, but it probably occurs in Italy before the FSoA. In Spain the drop in consumption of oil must be very similar, maybe worse. I can tell you that the fall in traffic is very noticeable, there are a lot less trucks in the highways, and in Alicante, for example, Maisonnave Avenue that joins two big Corte Inglés stores at each extreme, the traffic of cars is almost nonexistent, perhaps one tenth of what it was in 2008. In Madrid the drop in traffic in the public Subway Metro has been more than 30% and that's official figures. Seems that the adaptive measures to higher fuel prices have economic side effects. For example, going to the store once a week instead of twice a week implies a drop in side expenditures (restaurants, say, vehicle maintenance, impulse purchases, etc.). Higher fuel costs increase overheads for irreducible needs (beyond some point heat, lighting, operation of industrial or business machinery, etc). General costs will rise, decreasing disposable income. All this has got to feed back to decrease the ability to afford fuel, which, as Dr. Bardi points out, is a more critical factor than its availability/price. I'd love to see this analysis plotted against the ability-to-pay curve (factoring in changing income and its actual purchase power?). I'd expect this curve to be declining, exponentially, as well, though it may still be toward the flattish cliff top. Thanks for your contributions, Dr. Bardi! What do indicators for other modes show? Are intra city transit systems gaining ridership? Inter city rail and bus? Rail freight? Or is this just contraction across the board? I have no data at hand, right now. From what I can see around here, buses and trains are more crowded than a few years ago, but I also see that buses and trains become older without being replaced and rides become less frequent and some routes simply disappear. My interpretation is that buses and trains are not less expensive than cars and so they suffer the same problems. So oil consumption is down, but what you don't report on is if the quality of life, comfort level, or other lifestyle indicators (such as happiness, clean streets, general calm around dinner time, etc.) have stayed the same. I suspect they have increased as oil consumption has decreased. So far, I don't see this effect around here. The reaction of most people I know, those who still have a job, has been to increase their efforts to stay afloat. In other words, work harder to stay the same. And those who have lost their job are in big trouble. I would say that the quality of life is distinctly worsening for most of us. But it is just an impression of mine. Excellent article. Very revealing. It reminds me, and I know analogies are risky, of the change of flow of oxygen to vital parts of the body when people dive underwater. I wonder if this will make the various regions of the country feel more isolated, although there is still excellent telecommunications face to face is still preferred for many discussions. In my own country, Australia, we have vast distances between major cities, and even regional centres, if we had a 30% drop in consumption I don't think we would handle it as well as Italy has. Regarding traffic jam in big cities, I think too that they won't disappear soon, at least in the centers. Car use in jammed cities is very different from out-of-city car use, by its much higher "time-cost to fuel-cost" ratio. This means that for someone who chooses to drive in a city, fuel cost is a much smaller part of the equation. Plus, car users in cities tend to be richer than the mean, and de-growth may come with more revenue inequalities. It is really a excellent article,keep sharing.